Here i wanted to play with ordinary everyday’s objects! Bring them in to the life! Not exactly like Frankenstein but close to that! :) Every material, atoms in some ways are alive and create life! Its understandable when we speak about animals, humans et cetera.. . We are alive but what about trees or candle, bottle of Coca-Cola? There is coming more interesting to matter what I wanted to search in this painting! There is no permanent in our lives! Time fly away, everything change, reborn! That what now is reality sometimes ago was fairy tales, I think that’s including our future in some ways! But what happening if even for a moment or day, we in some strange ways are able to see all materials are alive! Is that would change our view on life or attitude to everything!? We ourselves build our reality, and knowing world that we accept! But can it be something else? I think this is superb! every time i look at this i see something new. wow! you are talented! You are right and I like this painting although I have to say that my fave so far is the one in the previous post! I like the dimensional look of this. Another masterpiece of yours Mikko , so fantastic coloring and you never get tired looking at it ! Among many 'dead' things I see two swans...or is it my imagination ? You are so right! What I love about artists is the ability to know "soul" and the essence of all things. This is a beautiful painting. Thank you for visiting my blog. This painting is impeccable! You really captured such real beauty in it. Thank you ever so much for dropping by my blog, as well! It is surely something to think about Mikko. Simple objects so beautifully rendered. This is beautiful. You know, I think a large part of art is the ability of making everyday objects transform into something special and meaningful. This is exactly what you did here, and it's stunning. Breathtaking landscapes are bound to make for a beautiful painting or photograph, but only a real artist can truly transform an everyday object into something magical. NICE work! I love the candle! It's my favorite part...how it's just barely been put out and you can still see a little smoke...beautiful! I am amazed at the thoughts behind this beautiful work.. well, to be able to see even the smallest inert object live makes us to be in a present moment! Thank you so much for your amazing comments! i am really appreciate it! Beautiful, I love it! Thank you for your comment. you surely have a talent in art! Thank you for commenting on my blog. Your art is beautiful. Wow! This is awesome! I like the idea of seeing something more to an object than what initially meets the eye, and bringing that out in your artwork. Your compositions are stunning. Thanks for stopping by my blog and your kind comments :) Awesome paintings! I like the illusive quality of it. And it's gotton me quite thirsty for a Coke! this painting is so beautiful! Nice that you tried to bring the materials alive! I love your last sentence :We ourselves build our reality, and knowing world that we accept! Thanks for following, dear! I'm following you back now! amazing post, i really love it! beautiful words and nice pictures! I see a little influence of Dali??! Pintas tu??? si es así lo haces genial!!!!! Simply amazing! I've posted some of my art work on my blog too... now you are inspiring me to start painting again! Very nice painting Mikko! You are talented! 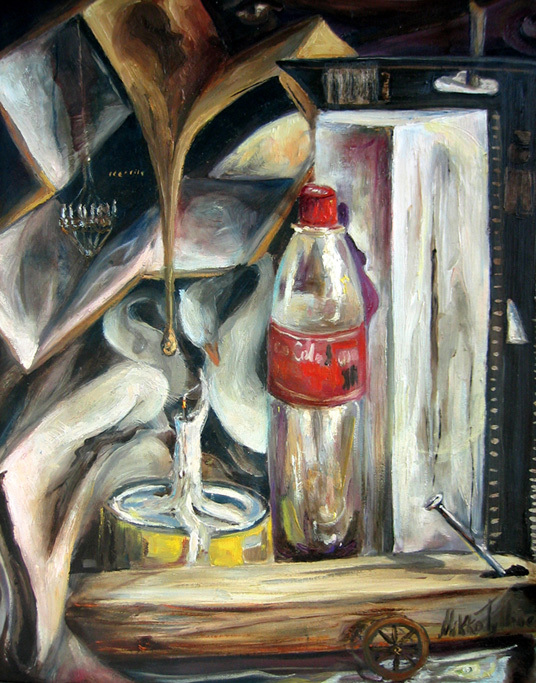 I like the coca-cola bottle in it :) I haven't painted with oil before - only acrylic. Thank you so much for saying hi on my blog. I really appreciate it :) Hope to see you back. I takes talent to make a coca cola bottle a piece of art that people can appreciate. I love the concept behind this piece, well done. Wow U have a fantastic blog full of inspiration! I must follow it! Really great pics, very special. Yes this painting have a great influence of Dali! He is one of my favorite artist! What can i say he was a genius! I am very gratiful to you all for your comments and for your visiting my page! it a great pleasure and honor to see you here! this is really interesting..! I love the way you represented the coca bottle.